J.D. 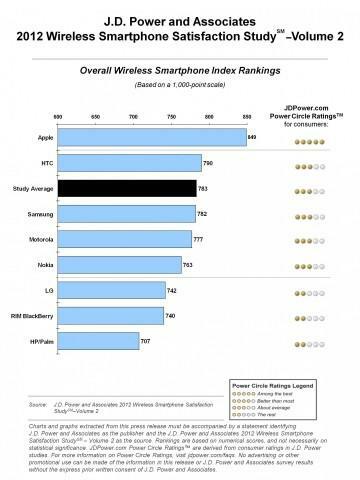 Power and Associates released its 2012 U.S. Wireless Smartphone Customer Satisfaction Study and 2012 U.S. Wireless Traditional Mobile Phone Satisfaction Study recently and found that Apple, for the eighth consecutive time, ranked highest in customer satisfaction among all smartphone makers. LG ranked the highest in the company’s traditional mobile phone study. Apple received a score of 849/1,000 and was followed by HTC with a score of 790, the industry average with a score of 783, Samsung (782), Motorola (777), Nokia (763), LG (742), RIM (740) and HP/Palm (707). Oddly enough, the group found that gamers spend more per month for wireless services than non-gamers. J.D. Power said that gamers spend $13 more, on average, each month than consumers who don’t download gaming applications. Social media addicts spend $12 more per month than those who do not download social media applications, too.